Do you like your popcorn salty or sweet? Maybe a combination of both? Perhaps salty for a movie snack but sweet for dessert? 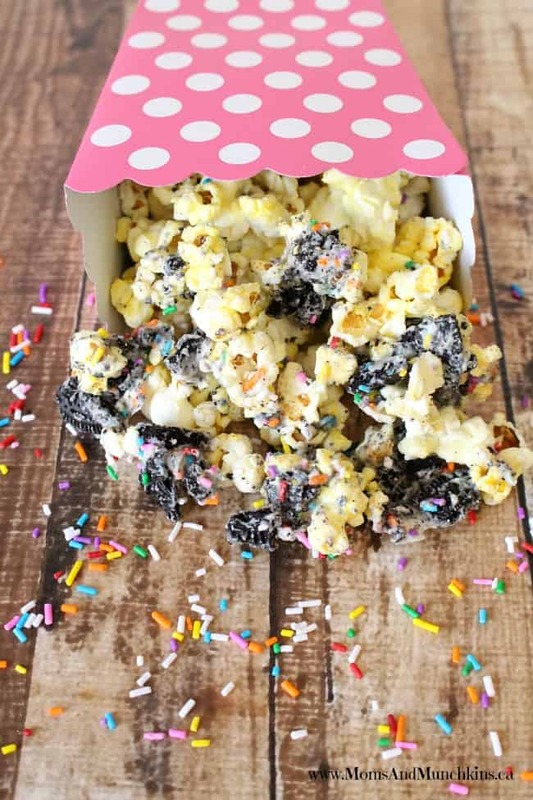 Today we have a delicious recipe for Birthday Party Popcorn that is really easy to make. I’m not the biggest fan of white chocolate but it fits this recipe perfectly. Serve this as a sweet treat for your family or save it for your next birthday party celebration. For this recipe, I don’t use quantities because you can just add however much of each ingredient as you like. Prefer more cookies instead of chocolate? Add them in! Worried about overdoing the sprinkles? Impossible! If you can’t find the Birthday Oreo Cookies, any chocolate sandwich cookie will do. Change this recipe up to include any of your favorite cookies – they’d all be perfect in the recipe. There are no quantities listed here because you can add as little or as much of each ingredient as you'd like. Line a cookie sheet with wax paper and spread popcorn evenly over wax paper. Pour white chocolate over popcorn and use spoon to stir and evenly coat. Sprinkle crushed cookies and sprinkles over top of popcorn. Place in freezer for about 10 minutes to harden chocolate. Put Birthday Party Popcorn in a large resealable food storage bag and store in refrigerator. For more sweet treats, visit our Party Food page. 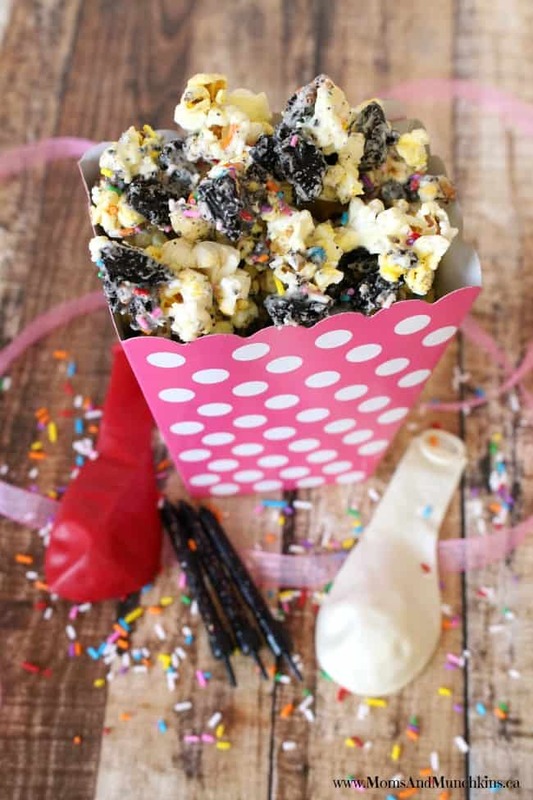 Looking for more sweet popcorn recipes for family movie night or your next party? 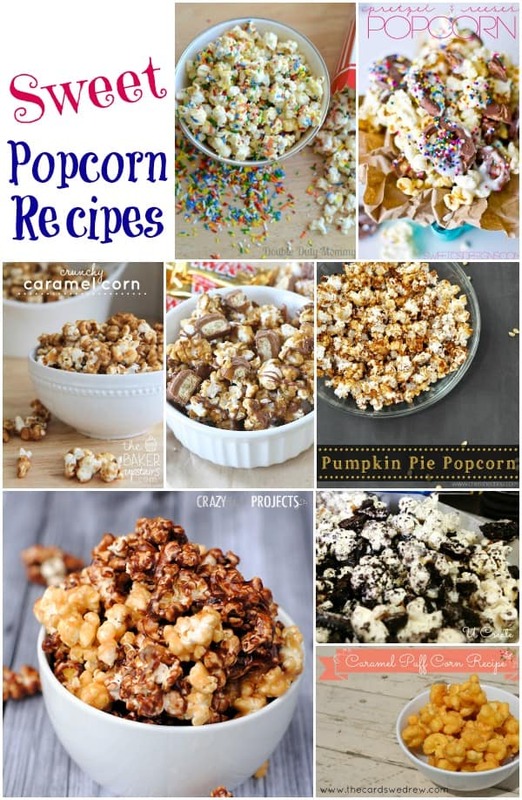 Check out this delicious collection of Sweet Popcorn Recipes. We’re always adding new & tasty ideas. Never miss an update by following us on Facebook, Twitter, Pinterest, Google + and Bloglovin’.